With these words, Paul Kagame did two things simultaneously: he earned a spot in the top-10 memorable quotes from the recently concluded World Economic Forum (WEF) Summit 2013 at Davos-Klosters, Switzerland. More importantly, his remark implied that Sub-Saharan Africa today is underscored by a profound failure of African ownership of lingering problems and potential solutions – a failure of an African conceptualisation of these problems and their solutions and consequently a failure of taking responsibility for successes and failures. Recently, Africa has come under the spotlight as the rising continent of “opportunity” far from its hey days of being the melting pot of “darkness” and “hopelessness”, in the paraphrased words of Joseph Conrad and The Economist. The pockets of high economic growth fuelled by a boom in global commodity prices of which many African countries are merely exporters, and the purchasing power of an elitist “middle class” and of diaspora Africans going-back-home has led to a wave of justified Afro-optimism. More recently, this bubble of optimism has been punctured by those toeing the line of caution, myself inclusive, on the need for more sustainable economic growth, equitable distribution of resources, and institutionalisation of effective governance. The evident polarisation in the discourse on Africa’s fortunes between the optimists and the skeptics is arguably due to the lack of ownership of the African situation today and of the discourse as well. 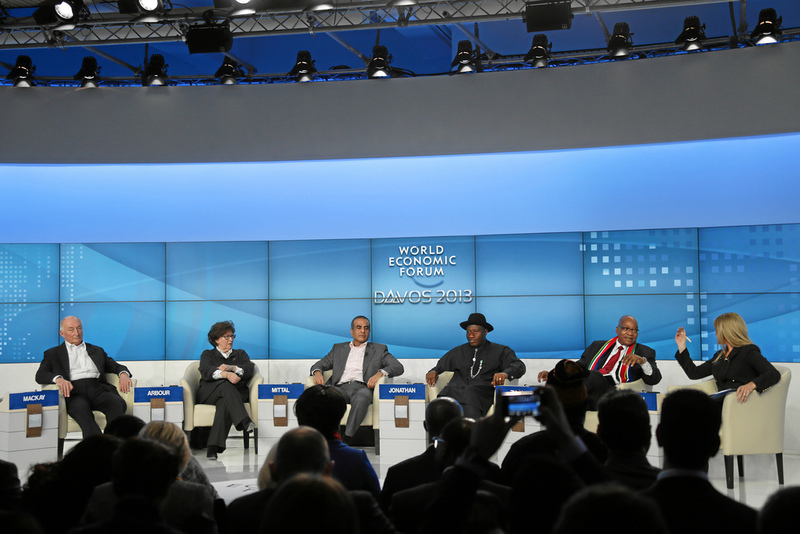 This variation in this discourse on 21st century Africa was discernible at the WEF where the movers and shakers in global politics, global economy, the academia, entertainment and the International NGO circuit exchanged ideas, visions… and contact details. On the one hand were African leaders such as Nigeria’s President Goodluck Jonathan marketing Nigeria’s Agricultural Transformation program to investors; South Africa’s Jacob Zuma with a presently expanding leadership role on the continent speaking about ambitious infrastructural projects and efforts towards greater regional integration to boost intra-continental trade and several CEOs of global firms like Renault and Coca-Cola stressing the vast opportunities for profit-making in Africa. A more cautious position was adopted by Louise Arbour, President of International Crisis Group while highlighting significant challenges of governance, weak institutions and political and economic exclusion which foster inequitable distribution of resources, create grievances and eventually culminate in conflict, a serious threat to economic prosperity. While Nigeria’s Central Bank Governor Sanusi Lamido Sanusi adopted a middle ground tone in emphasising that despite significant successes in governance, infrastructure and resource-based industrialisation is needed for Africa to move up the value-chain. Where does ownership come in within the discourse on Africa’s fortunes? It is precisely due to the lack ofownership that Africa’s story today is varied and that a divergence is apparent between the optimists and the cautious skeptics. This (lack of) ownership means that economic successes across much of the continent are driven by external factors: the boom in global commodity prices on which the economies of many African countries – Nigeria, Botswana and Zambia among others – depend on and the global financial crisis prompting many diaspora Africans to make the strategic move back home and global firms to look for new frontiers of massive profits in modernising African cities and of course, the role of foreign development aid. Africa’s current economic successes can hardly be credited to conscious and deliberate policy by African policy makers, thereby questioning the sustainability of this “success”. The concept of ownership as identified in this context by President Kagame means African policy makers should take responsibility for problems: poverty, unemployment, inequality, infrastructural deficits, weak institutions and corruption. It means African leaders should take the lead in formulating transformational policies to address these problems: inclusive policies which will close the poverty and inequality gap and address hard infrastructure (such as roads, electricity and security) and soft infrastructure (such as governance, rule of law and regulatory environment) deficits to enable local businesses thrive whilst encouraging foreign investments. Overall, ownership of problems and solutions should mean that there is a strong link between the actions taken by African governments and resultant successes in addressing these problems, and that such successes are not merely the coincidence of external factors – the boom in oil prices, aid donors or the pinch of the global financial crisis. Effective ownership of problems and solutions means that in a few years, we should be able to quantify the jobs and agri-businesses that sprout from Jonathan’s Agricultural Transformation program or a significant bridging of the yawning gap between the haves and the have-nots in South Africa. This will be the real test of African success in owning the problems and solutions, and for more sustainable prosperity across the continent. This piece was originally written for Y!Naija Y!Policy Hub, the Internet newspaper for young Nigerians. Yes, Paul Kagame is right, African Leaders and the so called intelectuals are still under the influence of Neo Colonialism. I wholeheartedly agree! Sometimes I have the feeling that African Governments want it all. Taking “Western” money with both hands and on the other hand complaining about IMF and the World Bank’s neocolonialist meddling in their affairs. It is time to step up, Africa. I believe that economic (true) independence will come only through the reform of the inefficient government apparatus and the delivery of public services and opportunities to all citizens.